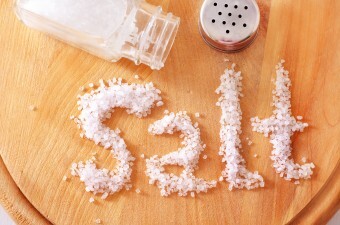 Mushyrulez asks: What’s the difference between Kosher salt and table salt? In truth, not much. The primary ingredient to both, not surprisingly, is sodium chloride. In fact, the U.S. government requires that any food-grade salt be a minimum of 97.5% pure, so any type of salt you consume in the U.S. (and most developed countries) is going to be almost exactly the same as any other type of salt in terms of what it is made up of. 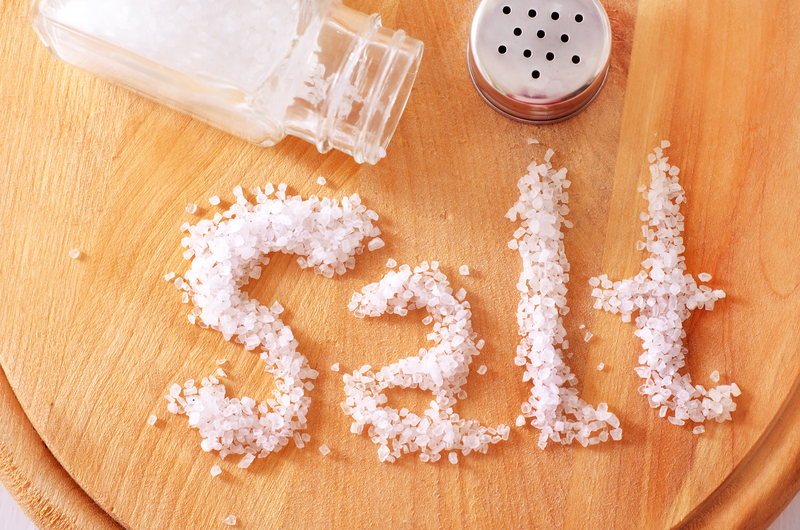 However, “Regular” or “table” salt does usually contain an anti-clumping agent, like calcium silicate or sodium ferrocyanide, and iodine (see Why Iodine is Added to Salt). Kosher salt usually doesn’t contain either of these things, though occasionally some manufacturers do put an anti-clumping agent in. But this is rare and even when they do, it’s usually much less than is in table salt. The most striking difference between Kosher salt and regular salt is just the grain size. If you look at table salt under a microscope, you’ll see that table salt has been milled such that many of the salt crystals look like little cubes. Kosher salt, on the other hand, is larger grained and less processed, allowed to keep its more random, crystalline structure. This size difference is directly responsible for how Kosher salt got its name. Contrary to what is often thought, Kosher salt is not called “Kosher” because the salt itself is specifically certified as kosher. Rather, Kosher salt got its name because this larger grained version of salt was used in the process of koshering meat, specifically to remove surface blood from meat (hence “Koshering salt” was shortened in some regions, like most of the United States, to “Kosher salt”). Smaller grained salts, like table salt, would have a tendency to absorb more into the meat itself, which isn’t what they’re going for here. By using larger grained salt, it absorbs the blood and then can be more thoroughly washed off after, removing the surface blood without making the meat overly salty. As such, buying any old Kosher salt doesn’t actually guarantee that it is certified kosher (although most mass-produced, food grade salts, of various varieties, are certified kosher). If you’re curious if the salt you have is certified kosher, just look on the container for a K or a U that is circled. If it’s there, it’s kosher, regardless of grain size or added ingredients. The word “kosher” comes from the Hebrew “kasher”, meaning “fit, lawful, proper). It first popped up in English in the mid-19th century meaning “ritually fit or pure”. By the end of the 19th century, it had also taken on the meaning of “legitimate”. When cooking, pay close attention to whether Kosher salt or table salt is called for in your recipe; 1 tablespoon of Kosher salt does not equal 1 tablespoon of table salt in terms of the weight of the salt. Specifically, if your recipe calls for 1 tablespoon of table salt, you’ll want to put in about 1.25 to 1.5 tablespoons of Kosher salt to get the right amount of saltiness. (The variation is based on the brand of Kosher salt- different brands have different flake sizes.) To be perfectly accurate, just go by weight, not by measuring spoons. Sea salt is typically bad for canning or pickling due to containing trace minerals that may discolor the food. The food will likely taste more or less the same in these cases, but will look funny. Kosher salt is generally preferred by chefs for a variety of reasons including: its coarser grains, which make it easier to handle with your fingers, measuring by touch; the larger grains also lend to making salt crusts on meat; it’s also free of iodine, making it good for pickling things; and iodine can affect certain molecules in some foods and itself has a somewhat bitter taste, so having salt free of iodine is typically preferred. Trouble is that in very humid areas the table salt will still clump. sing s few grains of ice helps to overcome this tendency. “Real” Kosher salt is made using the Alberger process that was patented at the turn of the 20th century. The only place in the US that still uses this is in a plant in St. Clair, Michigan. The process uses mechanical evaporation in large open pans. The process forms hopper or cup shaped crystals. These three-dimensional flakes have less salt compared to the same volume of regular cubic salt. The reason this is considered to be Kosher is that originally animal fat was used to prevent the evaporating brine from foaming and boiling over. The animal fat had to be prepared in a manner consistent with Jewish food preparation traditions. This required review and approval by a Rabbi. Animal fat has been supplanted by modern chemistry but the inspections are still done. I thought you would want to find this out today. @S E Wilson: Thanks for the info! Wow. No one is right at all in any part of what “kosher” means. It simply means blessed by a Rabbi. Kosher food is food that the Torah (Jewish Bible, otherwise known as the Old Testament) permits Jews to eat. I believe that the rabbi will bless only food that is (already) kosher. I am not Jewish…but from reading the Bible, and having Jewish friends, I do believe you are correct. Just having a Rabbi bless the food does Not make it “Kosher”. On a recent cooking show they explained that there is no kosher salt per se. Salt is basically refined to become table salt. To get Kosher salt they basically press table salt together to get the larger flakes and then package it as Kosher salt. Thanks for the thorough explanation of kosher salt. I couldn’t work out why it was being mentioned in so many USA recipes. In Europe it is not used as a general term for a variety of salt. Over here there is table salt (ground to fine grains) and coarse grain salt for cooking etc or for use in a salt grinder at table. All the other terms are used as well (iodized, anti-clumping agents, sea salt, rock salt etc) Rock salt from mines is generally food grade and the same rock salt is used for food and industrial purposes – only the processing and maybe additives are different). Of course the in the countries where they make sea salt they have an extra grade called flower of salt which is the very top layer of salt formed in the evaporation pans – it has a special flavour because it contains many more elements than just sodium chloride. Most salt in the UK is sea salt anyway as I suspect is much of the salt of Europe. Not all sea salt is made by evaporation. It was made when the sea receded from alt water areas and the land was uplifted. It is now mined but it is still sea salt. All salt is kosher. “Koshering salt” is a different thing. I am so tired of every single recipe in the US calling for “kosher salt” as some kind of special thing. Salt is salt, get a life. John, I have tried replacing Kosher Salt with Sea Salt (larger clumps) on many occasions in recipes which call for Kosher Salt and the results are always too salty. I hear it’s the size of the Kosher Salt which makes all the difference – I’m hunting down some Kosher Salt (not easy in Australia!) I’m hoping in this case ‘Salt is Not Salt’ so I can actually enjoy some of these recipes I find on the web! Properly stated, the cubic structure of table salt is not because of milling but is due to the crystalline structure (crystal lattice) of sodium chloride. As someone who has worked in the industry of refining salt, I have to say the only difference between food grade, and “rock salt” is how it is handled. Food grade comes from mines or is evaporated and strictly regulated by the FDA. Here in the USA that is. Rock salt or non food grade is refined in solar ponds. These can be seen on Google earth on the north side of the great salt lake in Utah. That is where I worked. On the south side of the lake is the ever so famous Morton salt.